Our revolutionary plain white tablecloths combine specially designed fibres with a unique soft touch finishing for a luxurious "cotton-soft" feel. Featuring a number of market leading features including unsurpassed colour retention, superb stain release & minimal shrinkage. There is a science to table linen. Our revolutionary plain weave fabric which combines specially designed fibres with a unique soft touch finishing for a luxurious "cotton-soft" feel. Our unique tablecloths offers unsurpassed colour retention, superb stain release, minimal shrinkage, excellent resistance to snags and outstanding absorbency. It`ll take more than a spilled glass of wine to spoil the occasion. Great all round service and products Our Response Thank you so much!! Good quality table cloth. Our Response Thank you for the feedback! 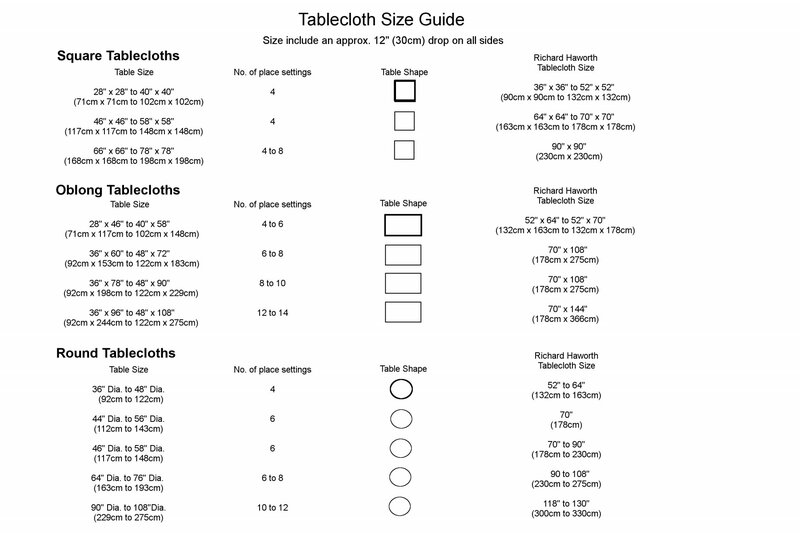 Good quality table cloth - restaurant style and quality Our Response Appreciate the great feedback! durable not the softer fabric but easy to wash and one of the few available at that size 3.30 round. Our Response Appreciate the feedback Blanca! Excellent quality Quick delivery Our Response That's great to hear, thank you for the feedback Dianne. This is an excellent quality cloth and washes well. Poor value cheap thin fabric Our Response I'm sorry to hear you are not happy with your tablecloth. Please note Signature's unique soft touch finish doesn't get activated until the initial wash, but if you haven't used the item yet please let us know and we can arrange for you to return and refund you for the item.